Feel free to send an email to info@budstheatre.com to register your interest! Join Buds Theatre as we explore Drama, Art and Musical Theatre through experiental learning. this June holidays! Suitable for children 3 to 13 years old, Buds Theatre's camps enable participants to gain personal awareness by utilizing devising and improvisation techniques. Each camp culminates in a performance scripted, designed and performed by the children themselves. Our camps will be starting from the week of 3 -7 June and will run all the way till 12-16 August! Check out our flyer for the dates and be sure to spread the words as we are offering a special 10% discount for sibling and multiple sign-ups! 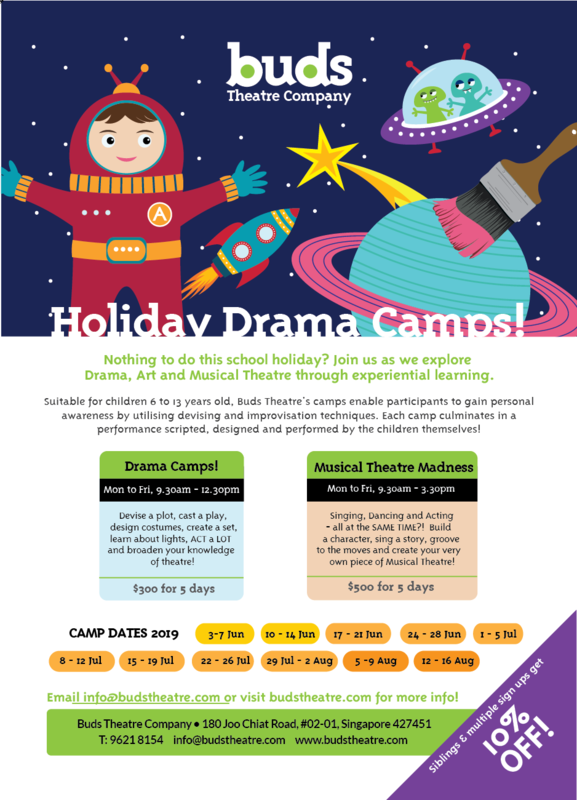 Come and join Buds Theatre for our Drama Camp & Musical Madness! We promise a whole load of creativity and fun for your children!